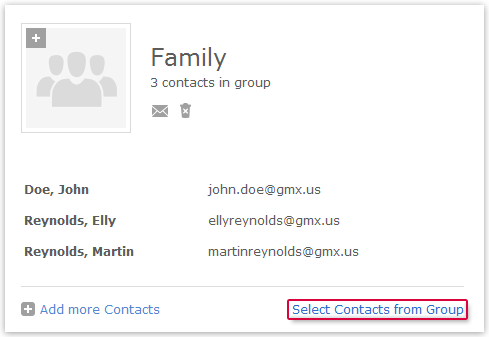 You can choose contacts within a group to send them an e-mail only or create a new group with the selected contacts. You can select all the contacts in a group with just one click. Click the Select Contacts from Group button. Adjust your selection by removing the checkmark next to individual contacts or adding other contacts. You can also search for other contacts or change the view. Your selection will not be lost. Select an action (Compose E-Mail,Create Group, Print contacts or Delete contacts) from the list on the right side. This affects all the contacts selected.